A mum has made a heartfelt appeal for all drivers to think twice before overtaking after she and her teenage daughter were almost wiped out by a HGV. Dramatic dashcam footage of Kim Lovelace having to take evasive action to avoid an oncoming lorry on her way to Peterborough on the A16 has emerged on Facebook. And now Kim, who lives with daughter Mary, 13, in Old Leake, Boston, has told how she just burst into tears in the aftermath of the incident as she realised how close they had come to a horrific accident. The heart-stopping footage was shared on the Idiot Drivers in Lincolnshire and the UK Facebook page. 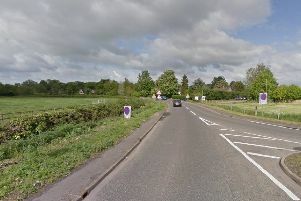 It shows the vehicle the dashcam is in is travelling at more than 50mph as the lorry overtakes it, and the oncoming headlights of Kim’s car approaching in the same lane as the overtaking lorry. Kim has nowhere to go, and the video shows how close the lorry comes to ploughing into her before she is able to swerve onto the verge at the side of the road and emerge on the other side of the lorry. The video shows her car almost touching the HGV as it emerges. Kim says: “As I came around the bend, I could see two sets of lorry head lights coming towards me on either side of the road. I immediately took my foot of the accelerator. I was traveling at 60mph at the time. “I realised the lorry wasn’t past the other lorry enough to get in on time so I started to brake and then realised I’d still have to pull into the verge to give it enough room to pass. “It passed so closely that I had no time to identify and details of the lorry or trailer! My heart was in my mouth. I grabbed my daughter on her leg and was just in total shock for a few seconds, and then I burst into tears. She said was driving to Peterborough with Mary asleep in the car at the time. She didn’t initially realise that the footage had been downloaded to Facebook, but saw it the following day. “I then realised that it was really as bad as I thought. For two or three days after, I still felt in shock and couldn’t watch the video anymore,” she said. She said she hoped any drivers who saw it would think twice about overtaking in future, particularly those driving lorries. She said she was also concerned about the speed the dashcam showed the vehicle which recorded the footage was doing as the lorry overtook it. The speedometer is at 51mph as her car is seen approaching, and has only dropped to 44mph at the moment she passed the lorry. Although it had Boston firm T H Clements on the trailer, the lorry was being driven for them by haulage firm Anderson’s Transport based in Bedfordshire.